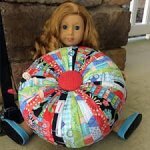 Kit to make an 8" tuffet. Perfect for an 18" doll or as a pincushion with attitude. Kit contains: feet, base, foam, batting, button kit, instructions. Just add fabric. Fabric needed: 9- 1.25" X WOF strips; 4" square for button, 8" square for bottom.